RAAF P-38 Lightning (PR) Conversion - for Academy P-38F kit. 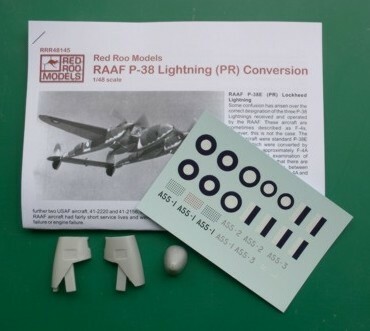 This conversion supplies the modified nose section for the converted RAAF P-38 Lightnings. These aircraft were operated in the PR role and this is the first time an accurate 1/48 scale conversion has been produced! The conversion also provides a decal sheet and detailed C & M notes for the three aircraft operated by the RAAF in WWII.